We're always sad to see a beloved TV show end — but it's even more infuriating when a show goes out with a cliffhanger, that was clearly intended to lead into another season of episodes. And yet, this sort of "cancelhanger" isn't always the worst thing. Some season-ending cliffhangers actually make for a poetic ending to a show, that leaves you with just enough room to imagine what might come next. Here are 10 cliffhanger endings that actually make for better-than-average series finales. Note: Four of these cliffhangers actually did serve as series finales, despite not being planned that way. The other six were resolved, and actually just served as season (or mid-season finales.) Either way, these are endings that were planned as cliffhangers, whether they served as finales or not. Also, we're not including the ending of Angel here, because it was planned as an ending from the start. 1) Buffy the Vampire Slayer, "The Gift"
Buffy sacrifices her life to save the world and her fake kid sister Dawn, at the tail end of a truly epic last battle against the mad god Glory and her followers/slaves. The show actually continues for two seasons after this, but at the time it felt as though a chapter was ending, with a new chapter beginning on a different network. And, to be honest, this is still a fitting send-off for Buffy, and the show was never quite as good again. This show ends with an especially stark, bleak fate for pretty much all the major characters except the snarky computer Orac. And this ending was originally designed as a cliffhanger leading into a possible season five — in which some of the characters could have miraculously come back. But this is a powerful, intense ending that gives Blake and Avon, in particular, the best send-off they could ever hope to have. It's hard to imagine that a later season would have given the show a better finale. 3) Fringe, "The Day We Died"
If things had gone differently, the end of season three could have been the series finale of Fringe — and it wouldn't have been a bad one, at all. The war between universes is averted, a dystopian future is prevented, and the two Walters meet face to face at last. But there's a cost: Peter Bishop is erased from history, so that nobody even remembers he was alive. As a cliffhanger, this was somewhat arbitrary and led to months of underwhelming stories about Peter slowly being reintroduced into the world — but as an ending, it might have been sort of fitting. We'll find out soon if Fringe has a better finale up its sleeve. 4) Heroes, "Brave New World"
The final season of Heroes was pretty dreadful, completing the show's long downward slide. But the season finale, which wound up being the series finale, actually gives the show a pretty perfect ending — not only does it resolve the question of whether mutants should be secret, it also calls back to the running theme in season one, where Claire keeps jumping off high buildings and videotaping herself. The rebooted V series never quite settled on a strong identity, or found its groove. The aliens were addicted to Anna's "Bliss," and constantly desperate to mate with humans, and yet they also supposedly lacked human emotion. And season two decided to try and fix things by adding Jane Badler to the cast, to win over the literally dozens of fans who were holding out for more shout-outs to the 1980s original show. And meanwhile, the Resistance against the aliens never stops being hilariously incompetent. So this season finale — which wound up being a series finale — is sort of perfect. The aliens finally more or less succeed in conquering humanity, giving their "Bliss" to pretty much the whole human race and making everyone Anna's slave. And meanwhile, Elizabeth Mitchell meets the real Resistance, the people who have been (alllegedly) getting stuff done while her tiny group has been spinning its wheels. 6) Space: Above and Beyond, "Tell Our Moms We Did Our Best"
Part of me is glad S:AB wasn't renewed. Rather than adjust their tone or premise in a desperate beg for expanded viewership, creators Glen Morgan and James Wong ended the series on their own terms. I'm still haunted by that last episode, by the heart-breaking emotion and narrative ambiguity that demonstrated just how far the series had come from its pilot. Space: Above and Beyond went down with its passion blazing and its middle finger raised. 7) Once Upon a Time, "A Land Without Magic"
Obviously, this show is a big hit and got itself a second season — which we're mostly enjoying for the hilarious, insane soap operatics. But in an alternate universe where this show only lasted one season, the first season finale probably served as a pretty good ending. The curse is sort of broken, magic comes to the real world, and all the fairytale people remember who they really are. There are some super emotional moments, like Henry waking up, and Snow and Charming being reunited. And yet, there's a sense of, "there's magic. Now what?" Might have been a great way to go out. This is a weird case — Supernatural really ought to have ended after five seasons. Not only is the season five finale a perfect ending for the show, it would have been one of the all-time best series finales of any show, ever. This episode brings everything full circle and shows how the Winchester brothers have grown and changed over the course of five years, while resolving the huge cosmic Lucifer/Michael storyline in a suitably epic (if low-budget) fashion. The main cliffhanger element is that Sam Winchester gets pulled into Hell and then we see him mysteriously standing under a street light watching Dean's newfound domesticity through a window. But that probably would have been a nice last thing to be wondering about, after the show went away. Instead, we got three more seasons of sometimes entertaining, sometimes confounding wackiness. 9) Vampire Diaries, "The Departed"
This is another show that we're still enjoying the heck out of — and yet, there may never be a better ending to the show than Elena finally becoming a vampire by dying in a way that parallels her parents' death. And if things had gone somewhat differently, this would have been the series finale of BSG — due to the writers' strike, production on the show was put on hold for months, and eventually the contracts for the main actors were in danger of running out. Renewing all of those contracts might have been impossible, so if the strike had gone on a bit longer, the show probably would have ended with the Galactica crew finding Earth... and it's a nuclear wasteland. This would have been one of the all-time great bleak, downer endings in science fiction history, and pretty much nobody would have hated it. 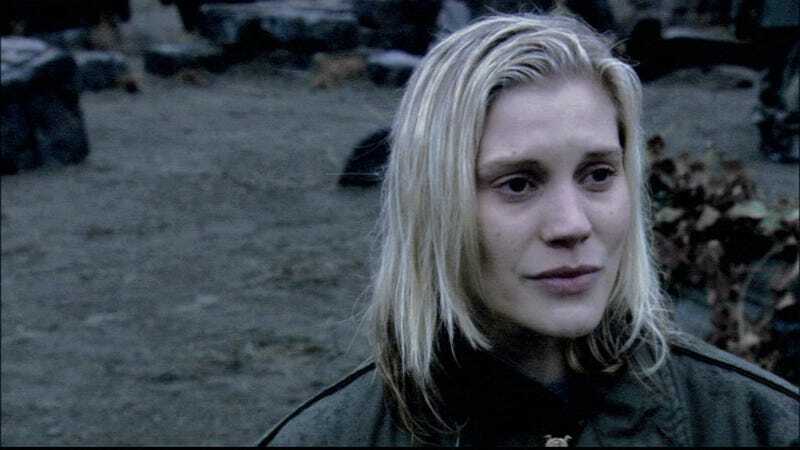 It would have been of a piece with the overall tone of BSG, and we'd still be talking now about how brave the show was to go to such a dark place.